While the Local Control and Accountability plan is a 3-year plan, school districts are required to solicit input and review the plan on a yearly basis. As part of our 2017 update we facilitated a district-wide survey, in person community consultation, and a webinar. These consultations solicited feedback about our programs, services and needs from students, parents, community members and staff. 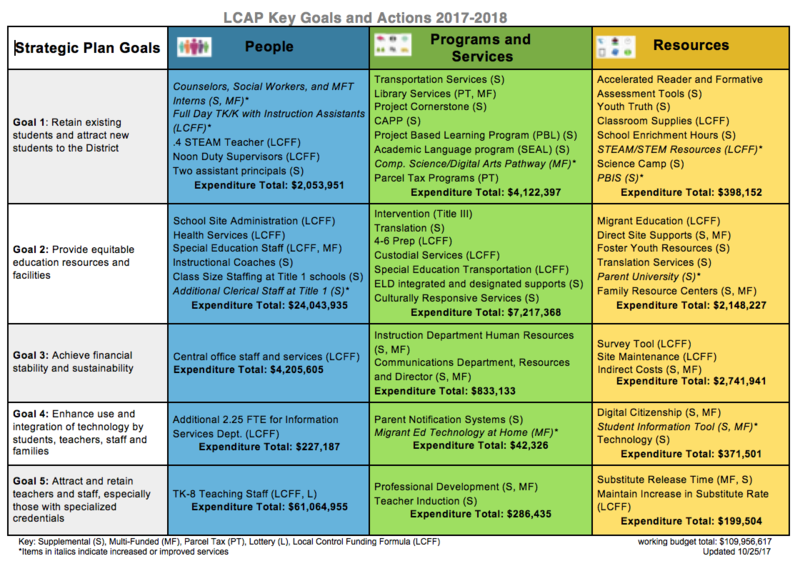 In late January/early February community stakeholders had the opportunity to respond to a survey asking for feedback around District strategic goals as they related to the eight LCAP priorities. The survey was administered in English, Spanish and Vietnamese. · At school I want my child/student to __________. · I would like to see __________ improve. This data has been compiled in English, Spanish and Vietnamese. Superintendent Gomez and Assistant Superintendent Deguara shared a draft of the 2017 LCAP actions and services with the District English Language Advisory Committee and District Advisory Committee on February 15, 2017 at 6:00 p.m. in the Evergreen School District Teacher Center (3188 Quimby Road). You may view the presentation (PDF) and a LCAP draft (PDF). Per education code, Superintendent Gomez is required to respond to questions from the District English Language Advisory Committee and District Advisory Committee in writing. Committee questions as well as responses from Superintendent Gomez are available for viewing (presented in English, Spanish and Vietnamese). Please see LCAP Development DAC/DELAC Parent Questions (multilingual) (PDF). An update and draft LCAP was presented to the Evergreen School District Board of Trustees on Thursday, April 13, 2017. The Public Hearing was held on May 11, 2017. We invite you to view the Evergreen School District's LCAP Plan (PDF). We value community feedback, suggestions, and thoughts regarding the Local Control and Accountability Plan process. Please share additional thoughts and information.